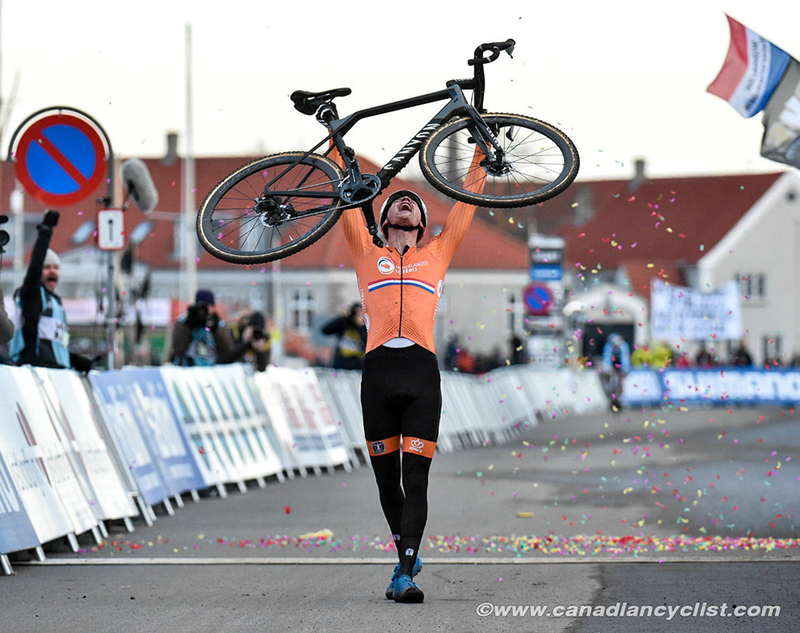 The Cyclo-cross world championships concluded on Sunday in Bogense, Denmark, with the Under-23 women and Elite men, and the Dutch took both titles, shutting out arch-rival Belgium. 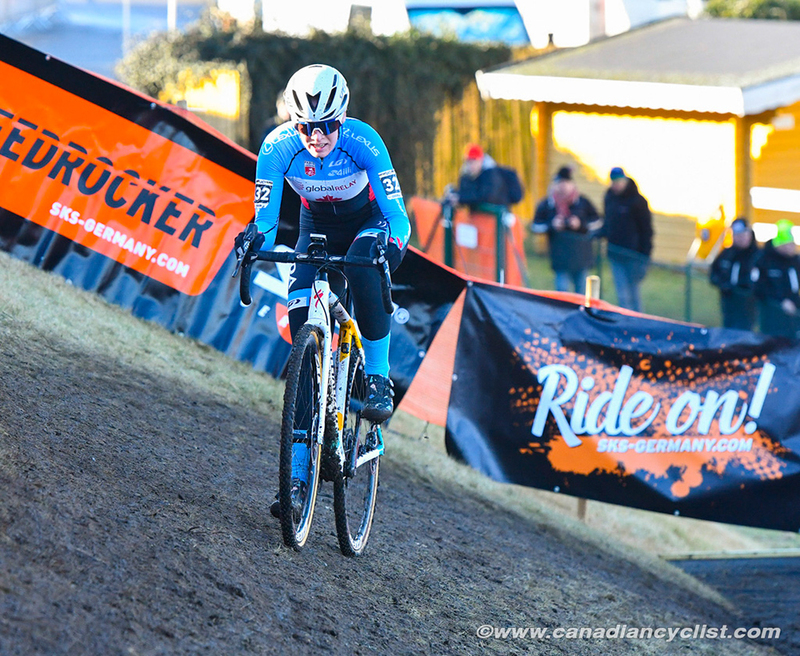 Ruby West was the top Canadian rider of the day, finishing 20th in the Under-23 women's competition. 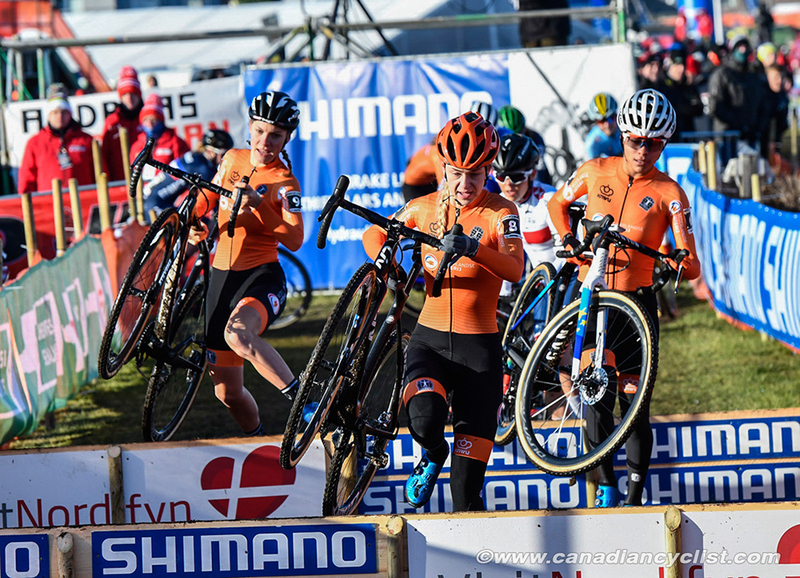 In the Under-23 race, the Dutch dominated, sweeping the podium, with Inge van der Heijden taking the title. West had a front row start, but was swamped in the very fast first lap, dropping to 19th. She rode as high as 18th in the first half of the race, before dropping a couple of spots in the second half. Magdeleine Vallieres Mill moved up from the back of the field to 22nd by the end of the first lap, but faded in the later laps to finish 28th. Sidney McGill was 41st, Dana Gilligan 44th and Kelly Lawson 46th. "It was pretty sunny out there and the course tacked up a bit from yesterday," said West. "There was more traction, so it was a blazing fast race from the start to the finish. The start is tough because it is such a long pavement section. I missed my pedal a little bit and a split second is all it takes for everyone to swarm you. I tried my best to keep moving up, but everyone is at their max. The lead group was gone, so I spent all race chasing. Starting on the front row, I was thinking that a top-10 was pretty plausible, so I'm a little disappointed with the placing. But that is what I had. I have to be happy with the effort, but maybe not the result I was looking for." The Elite men's race quickly boiled down to a battle between the Belgians and the Dutch - more accurately, between Mathieu van der Poel of the Netherlands and the Belgian team. van der Poel has pretty much dominated every race he entered this season, and it was the same in Bogense. 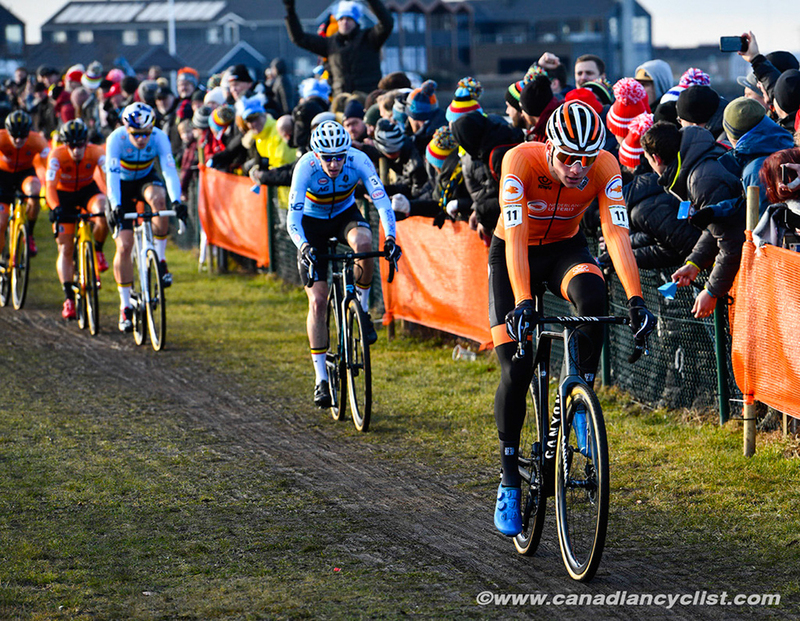 After sitting in the lead group on the first lap, van der Poel surged and only defending world champion Wout van Aert (Belgium) could go with him. 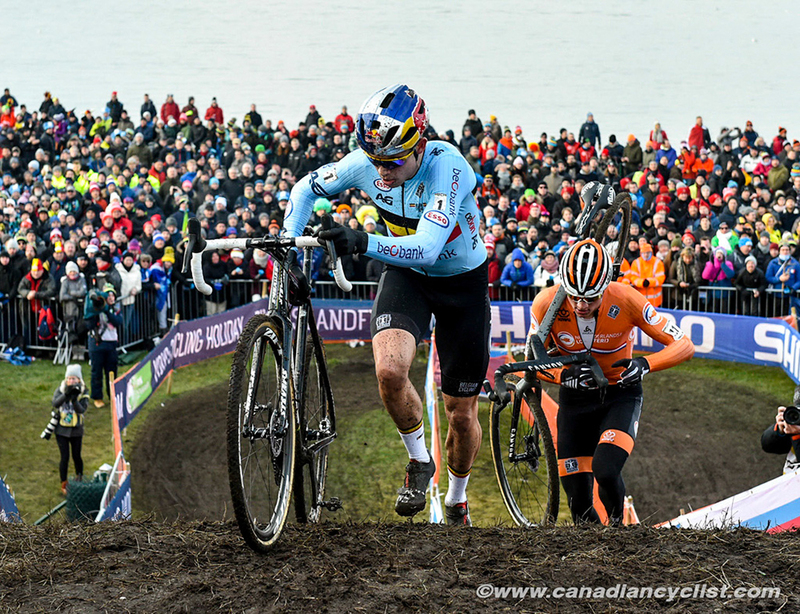 The two rode together for the first half of the race, when van Aert slipped in a muddy section, coming off his bike and then van der Poel rode away. With a lap to go, he was more than 30 seconds ahead of van Aert, who had been caught by team mate Toon Aerts. 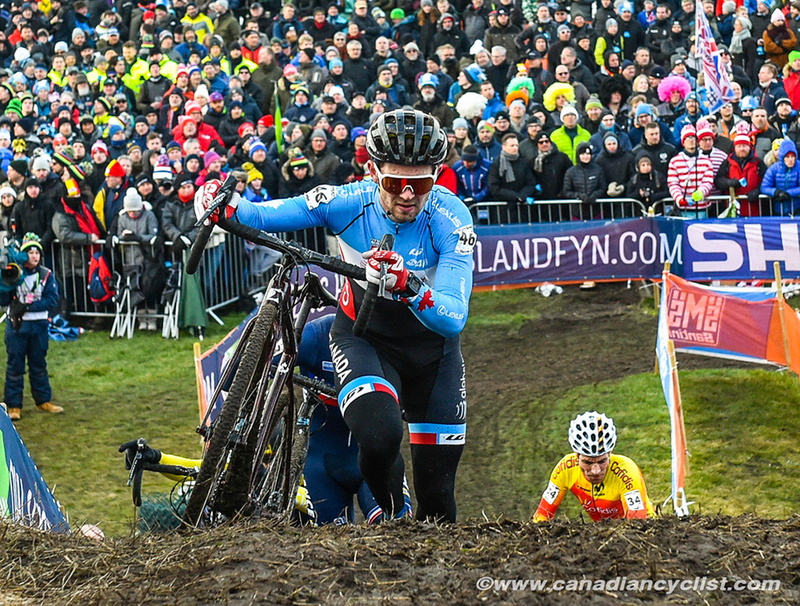 van Aert managed to get a small gap when Aerts came off his bike on the last 1/2 lap to take silver. Belgians took second through fifth, plus sixth and ninth through 11th - eight of the top 11 spots - but it was small consolation to losing the title. "It was hard, a very long race," said van der Poel. "The course was actually pretty hard and it was very fast at the start. I was pretty confident, but it is the world championship, so it is always hard to win. I'm glad I can wear the jersey again ... it's been too long." Canadian champion Michael van den Ham had the top Canadian result, finishing 35th, with Cameron Jette ending up 56th. Van den Ham was part of a large group riding about four minutes down on van der Poel, and it appears that they were all mistakenly pulled with two laps to go. "It was definitely a surprise that we got pulled," said van den Ham. "We were in the middle of the race, so we weren't expecting to get pulled, and I think maybe we weren't supposed to get pulled. I was looking for a top-30, but I really didn't know what to expect [he was hit by a car while training earlier in the month]. There was a couple of weeks when I really didn't know if I was going to be able to race Worlds, so it's a bit of a victory just to be here and be feeling good. But I really wanted to be in the top-30 and we weren't that far away." Scott Kelly, team manager for the Canadian squad, said "Overall, I'm really happy with how this project went. We had the [World Cup final] and Worlds both as part of the project, and I'm really happy with the learning and development that went on. Our young cohort of riders is getting better every year and I'm looking forward to the progress we are going to see in the future."